Japanese manhole covers are surprisingly beautiful affairs; each city has its own unique design that reflects the city’s defining characteristics, and many of them are even painted in order to add to the general effect. 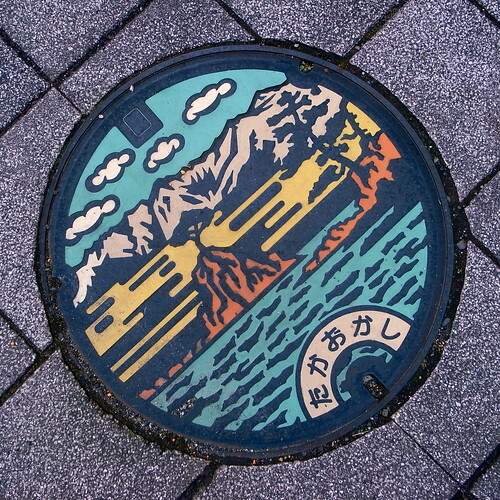 The manhole cover at the top of this post is from Takaoka and features the city’s famous coastal view of islands topped with wind-wracked pines in the foreground and beautiful snow-capped mountains in the background. When I visited Takaoka the view from the coast (where this particular manhole cover was found) did indeed look pretty much like the representation — aside from the fact that a low-lying layer of cloudy haze prevented the mountains from shining their whitest and brightest. The manhole covers in Toyonaka-shi, where I live, feature a happy cartoon alligator and a bunch of roses. The alligator is called Machikane-wani (“The Machikane Alligator”), and it’s sort of a local mascot. There are, of course, no alligators in Japan now, but there were 400,000 years ago when Machikane-wani ruled the roost. The enormous fossilized skeleton of Machikane-wani was found in 1964 somewhere in the vicinity of the Osaka University department of science and the alligator has come to represent both the city of Toyonaka and Osaka University itself. The fossilized skeleton is on display at The Museum of Osaka University (admission free!) and it’s huge (especially its hands and feet). There’s also a map of Toyonaka that you can stand on that makes you feel kind of giant, like Godzilla. I think I may have accidentally stood on my own house. The roses on the manhole cover, as far as I can tell, are there because of Toyonaka’s rose garden, which I have yet to visit. Paying attention to the manhole covers in Japan has made me start paying attention to manhole covers in general; when I went to Korea I saw that the elaborate representations available in Japan were absent, but instead there was a wide variety of amazing geometric decorations on offer. I didn’t really take as many photos of Korean manhole covers as I would have liked, and the photos that I did manage to take don’t really function as adequate illustrations of the elaborate geometrics that I came across. The square setting on the Ricoh GRD2, one of my favorite point-and-shoot digital handhelds, is especially handy when it comes to manhole covers. Somehow there’s something extra satisfying about dropping a circle into a square, and letting it sit there. Click here for my complete set of manhole cover photographs. Click here for the Japanese Manhole Covers Flickr pool. Click here for a CultCase piece on manhole cover designs. Click here for an NY times photojournalism piece on NY City manhole covers made in India. Trane, I never noticed any of these on your flickr stream. Now I saw you have a whole set! They are truly gorgeous, particularly the colored ones. Thanks for sharing! Gabi — I’m glad you like these shots. I should take way more of them (and I should have started taking them much earlier). I’ll be adding a few more in the near future, and probably a few more soon after that too. these are great!!! Thanks so much for posting the collection too. Thanks, Karen! I’m glad you like these. I think I may just try to take a few shots of Petaluma manhole covers when I’m out there this summer. Trane, I love this. I want to write a book whose cover it could grace (“Goldenchain” is maybe nearly worthy). Thanks for putting it on the blog, not just flickr. Damion — You would be more, much more, than welcome to use this shot, or a doctored alternative, as the cover for any book you might write. I can imagine it being redone in a very fetching David Lance Goines type of style. That’s actually the manhole cover for Toyonaka, the city I live in. The roses in the photo are there because Toyonaka has a famous rose garden, and the crocodile is there because of a famous crocodile fossil that was found in the Toyonaka area. You can still see the crocodile, called Machikane-wani, at the Museum of Osaka University. Love your site and love these shots! I just trolled your flickr feed–awesome. I’m working on an article on the topic of manhole covers and hoping you can send me your email so I can ask a few Qs? Sure, I’d be happy to answer any questions you might have about the manhole covers that I’ve seen! I’m not really any kind of expert though . . . I just wander around and shoot what I see.